One of the biggest things that concerned me was the obturator. 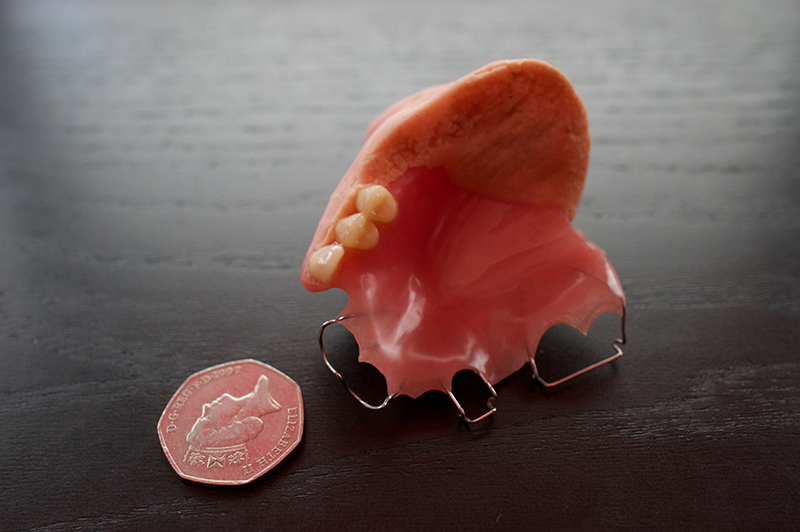 I have never worn a brace or had any false teeth, so I had no personal reference. I don’t know anyone who wears an Obturator - so I was a little concerned about the whole thing. At point of surgery, they usually (apparently) place a healing plate (although to be fair it is an obturator) into your mouth, so that when you wake up its all in there, nothing to worry about and nothing to do on your part. The most noticeable thing for me was the size of the plate in the roof of my mouth and at the back of my front remaining teeth. It seems so big and I do mean really big. I can't say how you will react but when I first felt it I didn't really freak out or anything, I had long since come to terms with the fact that I was going to be wearing it, I just remember thinking this is massive, not sure I want to live like this. I know that sounds over the top, it probably was, but at times when your mind isn't doing anything else you just focus on this damn thing in your mouth. I want to make it clear to you, if you are going to have this also, it is a shock, it isn't pleasant but you do get used to it and it does become part of you. Here is a picture of the healing plate that was put in at point of operation. Some of the gunk on there I can't get it off, I guess it is dried blood etc. Sorry about that! As you can see, it isn't pretty and to give you some idea of size I have placed an iphone and a 50 pence piece next to it. This is NOT the final plate, so don't freak out!!! There were times, around day 14 where I did gag (wretch, as if going to be sick) a little, that was a little scary but I soon took control of the feeling and got back to normal. I think this may happen to you - just remember that the plate isn't falling, it isn't obstructing and in a few minutes it will return back to normal. Try not to loose it! In my case and I would "think" that this would be the case for most people, certainly in the UK, you have to wear this for about 10 - 18 days or so, you won't take it out and you have to do nothing to it. Some may have the plate screwed into the remaining part of the roof of your mouth if you do not have sufficient teeth or retention to hold the plate up on it's own, I didn't need it screwing in but if you do, don't worry, you won't feel it and when they remove it, they do so under General anaesthetic I believe. At about day 14 I had a small operation under General Anaesthetic where my consultant took this plate out, checked the cavity, cleaned it out. At the same time, the consultant that would be looking after me in terms of creating a final obturator took a cast of the hole. This is my pink monster! Looks better in my mouth as it is a similar colour to my gums etc. The bung part (that sits on top of the plate) is taller in this version. Teeth - only three, but enough to make me happier about opening my mouth in front of people. Notice the pitting on the rear of the plate, this is wear and tear from eating etc. I have actually used sandpaper on parts to maintain smoothness. The two together - although still horrible (the pink one) it is a real step up from the previous one. As you can see it has TEETH - which brought a tear to my eye as I had all my top row of teeth removed and I felt a bit naked up there. This plate, I always remember, went in beautifully and felt so much better. I was really happy on this day. 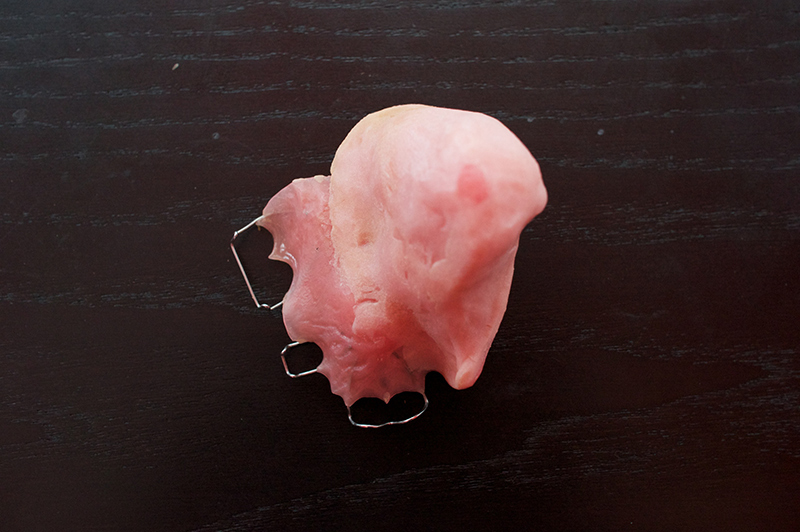 It is made of a plastic as the main plate and then the dentist (or whomever is doing yours) places this pink goo on top, pops it into your mouth and the goo sets to your shape - it didn't hurt or anything, just a little uncomfortable maybe. I have to take it out three times a day to clean it, and also my mouth - this is what I was told to do, so I do it. I have fortunately never suffered from infection at the wound site, I say fortunately, but I believe it is because I have been super diligent about cleaning - I can't warn you enough about the importance of keeping good oral hygiene with an obturator. I can't imagine what an infection would feel like, I have had enough pain thank you. I wash my hands first, or use one of those hand disinfectant gels you can get. I take my obturator out, wash it off under the tap and put it into a plastic pot. I take some mouth wash (I use corsodyl, that's my choice) and use a swab to gently go all around the inside of my mouth and up into the cavity, along my cheek. Then I use the swab with corsodyl to clean the obturator off and give it a fresh smell and taste. Takes about 3 - 4 minutes only. I am still wearing this plate (the pink one) now (August 2012) whilst I go through the process of having my definative obturator built, scheduled for an October/November 2012 launch... check the blog and this space then to see what the final prosthetic will look like! I have compiled a collection of obturator photos from around the web, you can view them here if you are interested, they do all look like something alien though, be warned.